What is a BOSS 302? It's a car, right? No, it's an engine. Well, yes, it's an engine and a car. Actually, it's car, a Ford Mustang, named for an engine, a special purpose built race engine. The Ford BOSS 302 Mustang, built for model years 1969 and 1970, is named for its engine. So which came first the car or the engine? The car. The Ford Mustang was introduced on April 17, 1964. In the 1960's, Ford was heavily involved in racing. The catch phrase was, "Win on Sunday, sell on Monday." In 1966 and 1967, Ford, with the help of Carroll Shelby and his Shelby-American company, raced Mustangs in and won the Sports Car Club of America (SCCA) Trans-American (Trans-Am) Sedan Racing series. General Motors' Chevrolet division introduced their Camaro Z/28 to compete with the Mustang in the 1967 model year. Not only did Camaro compete on the street and in the sales showrooms, it competed in the Trans-Am series as well. In 1968, Camaro won the series championship. It was a dismal year for the Mustang. Mustang's failure to win the 1968 championship was blamed on a new engine known as the "Tunnel-Port." For 1969, Ford had to do something to win back the Trans-Am championship. Actually, something was already being done even before the 1968 Trans-Am race season started. Ford was in the process of developing a new 351 cubic inch engine known as the "Cleveland" for 1970. It was so named because it would be produced at the Cleveland engine plant instead of the Windsor engine plant. Some engineers or perhaps just one engineer, Bill Barr, (as he told us the story at the 2011 Reunion) in Engine Engineering came up with the idea of putting the Cleveland heads on the Tunnel-Port block. It was tested and the results were good enough to continue development of the new 302 cubic inch racing engine as the Tunnel-Port started to have problems. One part of the SCCA rules stated the manufacturers had to sell what they raced. It was Larry Shinoda, a former GM stylist working at Ford, who created the car's unique styling and came up with the name BOSS 302 for the car and engine that would go into production so Ford could race it in 1969 and 1970. The BOSS 302 was offered in the 1969 and 1970 Mercury Cougar Eliminator as well. The Eliminator was also styled by Larry Shinoda. Ford came close but did not win the Trans-Am title for 1969 with the BOSS 302 Mustang. The BOSS 302 Mustang did win the Trans-Am championship in 1970 and entered the history books. *Note: this is the short story. 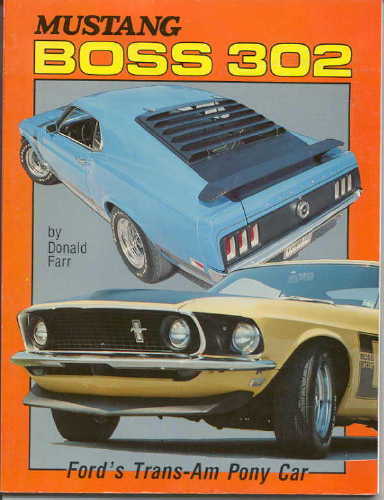 If you would like to know the full details behind the BOSS 302 story, read this book: Mustang BOSS 302 Ford's Trans-Am Pony Car by Donald Farr. Check our Links page for vendors that sell this book.